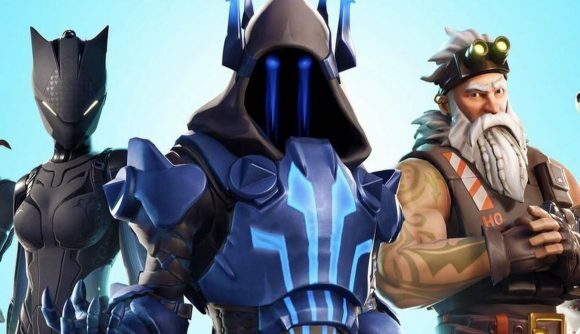 Fortnite’s first Season 7 skins may have leaked, as a new image has been posted on the iOS store showing off three new cosmetics (you can check it out in the tweet at the bottom of this article). The image showed up on the store’s ‘Games’ page earlier today, ahead of the “major update” scheduled for tomorrow. Lending extra credence to the leak is the fact that two of the skins match with the teasers that have appeared ahead of the start of the new season. While neither are named at this point, both the central and left-hand figures in the image at the top of this page show up in teaser images posted to Twitter over the past few days. The bearded character on the right is yet to show up, but we could see another image later today. The likelihood is that the two skins from those teasers will be accessible at the beginning of the new season – skins that have appeared in promotional materials have tended to be available as the skins available at the start of each new Battle Pass. That probably also means that at least one of the two skins can be upgraded – previous seasons have included upgradable skins as low-tier and top-tier rewards, and I doubt Season 7 will prove any different. The Fortnite Season 7 release date is tomorrow, and we’re expecting a late morning/early afternoon (GMT) drop. From the teasers, it looks like skiing and ziplines are heading to the battle royale, as well as a fine blanket of snow. If you’re planning to head out in search of that Victory Royale as part of Season 7, it might be best to wrap up warm.